A group of islands in the Atlantic, ca. 300 miles off the western coast of Senegal, West Africa. A former colony of Portugal, the history of Cape Verde (or "Cabo Verde" in Portuguese/Creole) is at least in two dark ways intertwined with that country's colonial and fascist history. 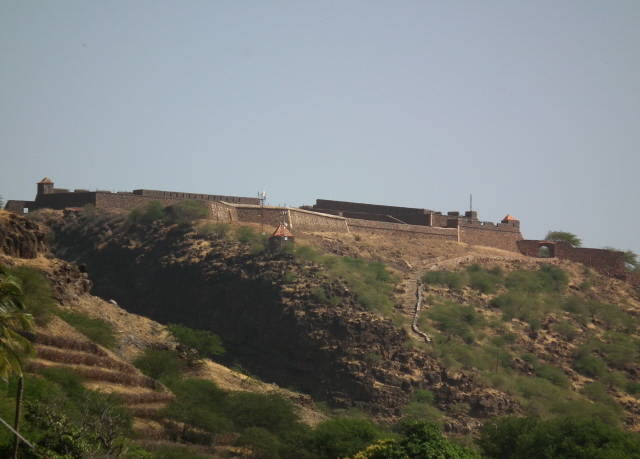 Like Senegal's Goree island (see Maison des Esclaves), the Cape Verde Islands served as a strategically important slave trading post during that dark era. Little remains to remind today's visitor of those dark days, though the old pillory in the village square of the ancient UNESCO world cultural heritage site of Cidade Velha on the main island of Santiago qualifies as an exception. Cidade Velha (simply meaning 'old town') was the first spot where the Portuguese colonialists established a permanent settlement (and military stronghold) on these islands, and it's mainly thanks to its cathedral ruins as well as to the fort towering over the village that the place was recognized as the historically most significant place of the nation. Since gaining independence from Portugal in 1975, Cape Verde has largely been a success story – against the odds. Politically, the little island nation has become one of the few "model states" of ex-colonial African states, with a free and stable democratic system that most of mainland Africa can still but dream of. On the other hand, the country has repeatedly suffered from drought and depended on help from the outside world, which it still does to a substantial degree today. Emigration is a key theme of the nation's psyche – and the Cape Verdean diaspora, larger than the population on the archipelago itself, makes a crucial contribution to the country's economy in the form of remittances. Not only water is a scarce commodity in Cape Verde, natural resources in general are few and only a relatively small proportion of the land can be used for agriculture (bananas, corn, beans, etc.). 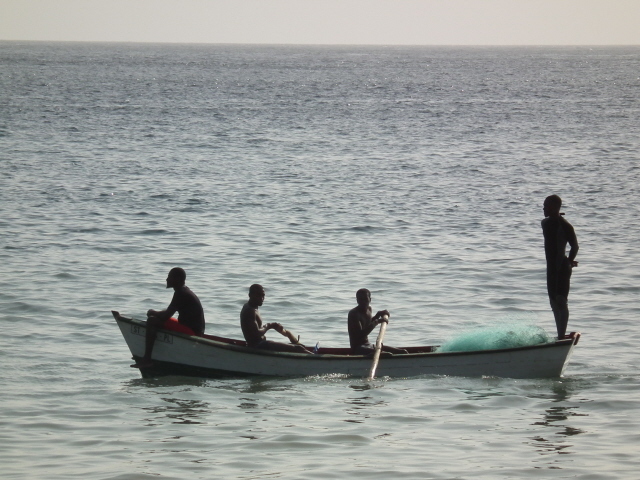 Fisheries are a much richer resource – and the waters around the Cape Verde Islands are one of the few regions in the world that have not yet suffered from overexploitation. With the nation's new intensified trading links with China, however, that may well change before long. Cape Verde, uninhabited until the arrival of the Portuguese explorers, can be regarded as the oldest Creole nation in the world – a legacy of both the slave trade and colonialism. And it shows in the mix of both skin colours (ranging from deep black to almost white) and language. Officially, Portuguese is still the national language, but in daily life the Cape Verdeans' own Creole language dominates, if only in the spoken form. All written language is in Portuguese. Foreign languages are sometimes spoken, with French being the most likely one to encounter for some reason. English is spoken by fewer people, but with a bit of a mix of a few words in Portuguese/Creole plus otherwise bits of French or Spanish, and the rest in English, it is possible to get by. Tourism has become a major economic driving force in last couple of decades, although most of it is rather of the sun-and-beach variety. Of the nine inhabited islands of the archipelago, the most popular tourist islands are the ones with the least resources in any other respect, namely Sal and Boa Vista. Being the geologically oldest of these islands they are largely eroded down to flat, bare expanses of sand. They are basically just one large beach. That may appeal to a sizeable proportion of tourists, but those islands are hardly representative of the nation as a whole. It is also questionable whether those water-intensive beach-and-pool resorts that form typical hedonistic all-inclusive tourist enclaves really are a sustainable way forward. Non-beach tourists will stay away from Sal and Boa Vista anyway, with nature lovers mostly heading for the northern islands, or to Santiago, the main island, which is known as having "a bit of everything" of what characterizes Cape Verde, including plenty of hiking options. For the dark tourist it is also Santiago, as well as neighbouring Fogo, that are the focus of attention. Travel to the island of Santiago is fairly easy, as the nation's capital city Praia and its principal international airport are also located on that island. There are regular direct flights e.g. from Lisbon, Madrid and also to/from Dakar in Senegal. Another option is getting one of the cheap package holiday beach tourist shuttles that go to Sal and get domestic flights onwards to Santiago and/or Fogo. The national carrier TACV has a dreadful reputation of being notoriously unreliable – but I never had any problems with them. Some islands are also connected by ferry services. For getting around on Santiago, you can either rely on the local public transport options (minibuses mostly) or hire a car. In fact driving on the winding mountain roads of Santiago is a major attraction in itself – which well justifies the relatively steep costs for car hire (and petrol is quite expensive too). In terms of accommodation options, things have gradually improved, also away from the big tourism centres of the beach-holiday variety … even though overall standards in the Cape Verdean hospitality industry still have plenty of scope for improvement. But it's alright. Just remember that this is a very laid-back culture so taking things in relaxed strides is the better attitude … rather than making elevated demands. 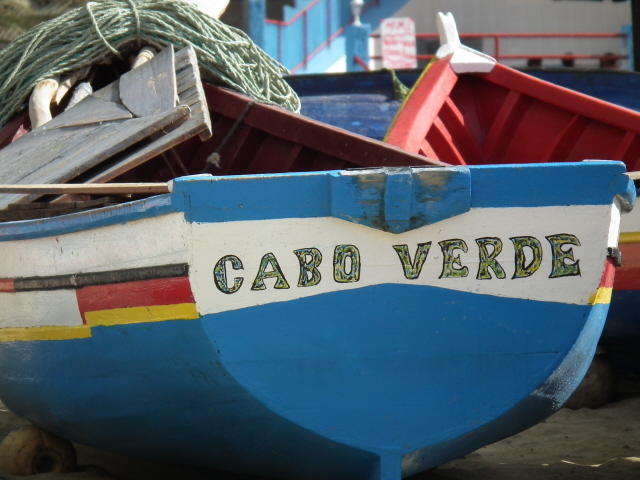 Cape Verdean cuisine predictably relies heavily on fish, and it can be of superb quality (and in the case of tuna still an option to be had without too much of a bad conscience, as it isn't yet as overfished here as it is in much of the rest of the world). The national dish is called "cachupa", which is a rich stew based on sweet potatoes, cassava, beans and maize, but this is usually only found in the version that includes pork or chicken, less often in the fish-based "poor man's" variety. Strict vegetarians will struggle in general. With regard to drinks, the main national tipple is "grogue", basically a kind of plain white sugar-cane rum. On Fogo, wine of good quality (at least the whites) is made, and coffee is grown too. Imported drinks are expensive. In general, prices can be rather high for a non-First-World country, but you have to remember the overall scarcity of natural resources that Cape Verde has to struggle with to put this into perspective. While it's perfectly possible to arrange travel to the main Cape Verde Islands independently, you may find that it is a lot easier and safer to go through an experienced, reliable agent/tour operator. For the British/English-speaking market, the company Cape Verde Travel (run by Ron Hughes from his base in Yorkshire) is a well-established expert to recommend as a first port of call. There is a surprising number of German-language operators too, some based in Cape Verde itself, so if that's your language you may want to rather look in that direction.